Mark Darrah, who has been working on the Dragon Age series since its inception and been at Bioware for 19 years, has posted on Twitter a short video of the design document for the studio’s next project – missing sadly anything past the cover and opening page. It doesn’t even confirm that the game is Dragon Age related, but the imagery and typography used is very similar to the medieval RPG’s style. This comes just a couple of months after Darrah tweeted a poll asking if players would be interested in a Dragon Age-flavoured XCOM/Fire Emblem-style tactics game. A bit of a departure from Bioware’s normal fare of making the best RPGs. The privilege of a senior producer is to be able to post something so tease-tacular on social media without getting a very nasty phone call. Obviously there’s very little to it, but that hasn’t stopped the speculation. The font on the one page seen is the one used in Dragon Age: Inquisition for all text, while the image on the cover is very much in that style. I thought I recognised it, but a little research suggests that it isn’t directly from any faction or character in the game, just similar to a lot of their logos. Your smartest money will go on this being the initial pitch for Dragon Age: Tactics, a game Darrah polled about on Twitter back in February. Assuming some initial work had already been done on the game by then, this would be a consistent timeline, though it’s far from normal for a game to be talked about this early, even in teasing tweets. Then again, Bioware have been on the long-tail plan for a while, announcing DA:I and Mass Effect: Andromeda years before they hit our hard drives or any solid details were available. 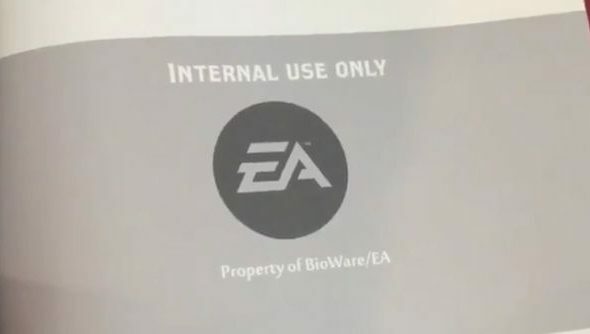 If the game’s more complete than this suggests, we might see more at E3, or at least confirmation that Bioware are working on something Dragon Age-related. Andromeda’s been officially pushed to early 2017, and it’s doubtful whatever this is hinting at would come out this year unless it’s very different from what we’re expecting. Maybe the long-rumoured new-gen Mass Effect remasters as a release for this year?